A series of breakout sessions were held after the introductory Jisc Repository and Curation Shared Infrastructure (RCSI) and RepNet presentations by Balviar Notay, Andrew Dorward and Pablo de Castro. These were aimed at getting the event attendees’ – a mixed community of IR managers, research information managers, project managers and developers, see event attendee list – input into what functionality they would like to see as part of the RepNet Applications/Use Cases. This was a chance for the community to feed in their requirements on how national services could improve local workflows and to discuss the added value the RepNet could provide for Repository Managers. Four breakout sessions were held on (i) reporting and benchmarking, (ii) deposit, (iii) metadata enhancement and (iv) repository platforms. Each of the groups had a pre-established set of issues to deal with (see figure below), plus clear instructions from the Jisc RCSI Programme manager to focus on infrastructure-related aspects. IRUS-UK Project was the focus of the Reporting and benchmarking discussion group, with examination of its present features and its potential for further reporting from RIOXX extended metadata set and through a future aggregation service. Enhancements to IRUS were suggested such as coverage extension to other types of materials beyond articles (e.g. learning resources) and additional IR metrics (among them metadata-only to full-text item ratio, Gold vs Green OA items or top monthly downloads by IR and nationally) that would provide an improved cross-repository description both for benchmarking purposes and as a useful feed to SCONUL. Finally, (P)IRUS prospects of using cross-repository COUNTER-compliant stats to benchmark with at least one publisher site were agreed to be important for demonstrating the value of the IR network for scholarly communications. Discussion on Services Supporting Deposit addressed technical and content requirements for the RJ Broker, such as how better metadata could improve the deposit process between scholary systems; SHERPA RoMEO service possible enhancements (together with JULIET); usefulness of Open Access mandates for content collection and mechanisms to make them more effective, and the need for publisher involvement in defining clearer deposit policies. The call for RoMEO enhancement issued at this session was to a great extent shared by all discussion groups and included the need for harmonisation in publisher policies for deposit – with suggestions for standard, simplified agreements to be put in place – plus coverage of copyright licenses (CC BY vs CC BY NC), journal compliance with specific Open Access policies and eventually article processing charges (APCs) rates at journal level. A wish was also expressed for clarification of Gold Open Access publishers’ rights regarding deposit into IRs. a desire to be able to consistently describe resources according to their publication status according to a standard vocabulary (e.g. pre-print, accepted for publication, final copy etc.). getting better quality metadata about other literature types (e.g. books, conference proceedings). Other topics discussed included the RIOXX guidelines and metadata application profile, the FundRef project pilot, and ORCID. The group was interested in each of these and was able to offer feedback on these various initiatives. A quick ‘straw poll’ of the group suggested that intent to engage with ORCID was widespread among the institutions represented. 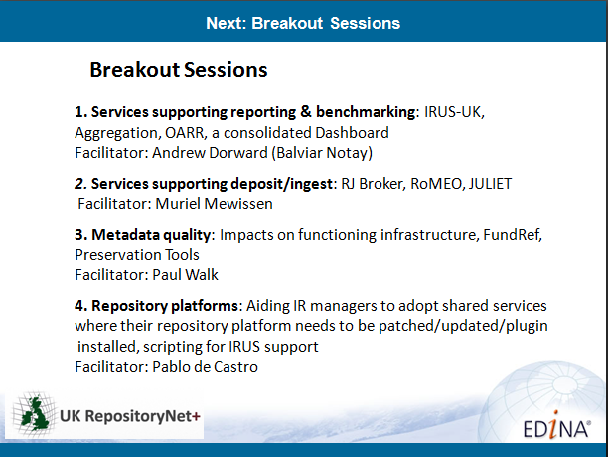 Breakout session 4 on Repository platforms put together a list of already available IR enhancements that should ideally become more widely implemented, including SWORD endpoint availability, IRUS-UK, OpenAIRE compliance, KeepIt! preservation feature or CRIS and REF2014 plugins for EPrints among others. The issue was raised that IR managers are often unaware of the different services available – something the RepNet Survey has recently provided useful evidence about. Since technical challenges for feature implementation are not critical enough to explain low implementation, this was mainly judged to be a result of the severe lack of awareness-raising mechanisms regarding available services. A request was made as a result for (i) investigating the appropriate hierarchical level at HEIs for proposing new IR service implementation and (ii) providing RepNet factsheets, ie one-page summaries providing human-understandable info about technological challenges for a given service plus best practice in its successful implementation by a specific IR manager. IRUS-UK service, whose patch takes 10 minutes to install for EPrints-based IRs and 30 minutes for DSpace-based ones, was identified as a potentially useful testbed for outlining successful strategies for widespread enhancement adoption by IRs – including the possibility of having its patch for EPrints added to the EPrints Bazaar service catalogue. Up-to-date adoption snapshots such as the RepNet-featured IRUS implementation map were also agreed to be useful. A presentation by Paul Walk followed the breakout sessions focusing on the first draft release of RIOXX application profile v0.8, which is now open to consultation. An overview of CrossRef features for automatic metadata collection delivered by Geoffrey Bilder provided a useful follow-up to this discussion. The afternoon session also featured Yvonne Budden on IRs taking centre stage in the future for the OA publishing activities at HEIs. This event highlighted that there was much dependency on having accurate and consistent metadata in repositories to then allow robust added value services to be built on top of them. The RIOXX work and initiatives like CrossRef and Fund Ref are starting to address the gaps in this area. The breakout sessions provided evidence as well for the fact that the repository community may now be reaching some consensus on what the relevant topics to address should be. Obviously more work will be required to validate these national services with further community engagement. All presentations are available at the RSP website, and a storify story includes the workshop tweets. Re: “Enhancements to IRUS were suggested such as coverage extension to other types of materials beyond articles (e.g. learning resources”. Also, the suggested “additional IR metrics” of “top monthly downloads by IR and nationally” is and always was already provided. Thanks for the other suggestions! However, what would be really good would be if all IRs participated with the existing service ASAP!